I’m not sure if I’ve explained why I am here. I am helping our Alaska office put together a proposal. It is due on Monday afternoon. So this week, the crunch was on. I was coordinating inputs from 5 different engineering firms. Needless to say, it was a busy week. So other than work, I didn’t get up to a whole lot other than the odd run near the lake (the one with all the float planes) and some pilates in the hotel room now and then. Thursday arrived and I felt that the proposal was looking pretty good, but there was a last minute site visit by some of the team. Friday came, and we waited for feedback from that, plus I needed feedback from two other people who were reviewing the proposal. Well, it didn’t come until late Fri, and in fact some of it didn’t come until Saturday morning. Needless to say, Fri was a late night at the office, and I was in there again this morning. But, the proposal is now pretty much ready. So with that lifted off my shoulders, I looked out the window and saw sun!! It was delightful. So my coworker who had come in to do some proofreading, and I, decided to take advantage of the weather. We headed downtown to a restaurant that had a nice big patio (yup – there are such things in Anchorage!!) for lunch. It was so nice to sit in the sun and have a beer, I can’t even begin to describe it. 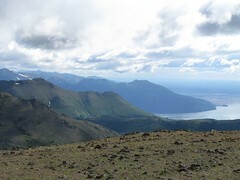 After lunch, I suggested we do the hike we had intended to do last weekend (but didn’t due to inclement weather), up to Flat Top mountain. So off we went! We certainly picked the perfect day. Flat Top is 1,070m in elevation, so nothing like the peaks in Bolivia (4,000+ m), but certainly just as steep! 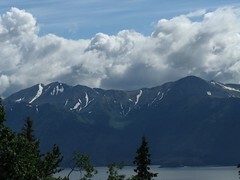 It is located in Chugach State Park, and is apparently the most climbed mountain in the state. We headed up in Greg’s truck. When we turned onto a road that looks directly towards where we wanted to go … we saw that the peaks had become cloud covered! But we continued. We arrived at the base parking lot and it was raining. Since we were already there, we decided to keep going. And so we started the climb upward. The first section was on nice groomed trails, with some stairs here and there. And it stopped raining! Then it got a bit more challenging as we scrambled over rocks and mud, up to the summit. It was certainly worth the effort though! When we got to the top, the views were amazing and the clouds were above us, not at our elevation. My photos don’t do it justice. The trail itself was 2.4km in length, with an elevation gain of almost 400m. I think it took us about 3 hours, although it didn’t seem that long, so I could be wrong! 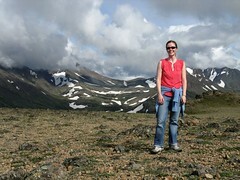 The vegetation was so green, and many of the mountains still had snow in patches. The afternoon in the sun and getting some exercise in the outdoors did wonders for my state of mind after being cooped up all week in the office! I have a few more days to go here. Monday I am in the office finishing things up, and Tues and Wed I have to do some more exploring before I fly out Wed night. I am looking forward to it, but also looking forward to coming home at the end of it.